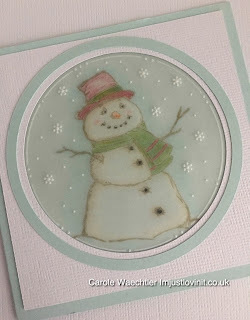 Groovi Parchment Craft Christmas cards - with Silhouette! I've been mixing my stash of designer papers, stamps, inks, Groovi plates, dies and of course my Silhouette Cameo to make a few Christmas cards. These were made by the ladies who came to my Groovi classes during November. Can you see how we used a few dots to break up the lines on the Groovi nested circle, I was really pleased to come up with that one, I hadn't seen it before. 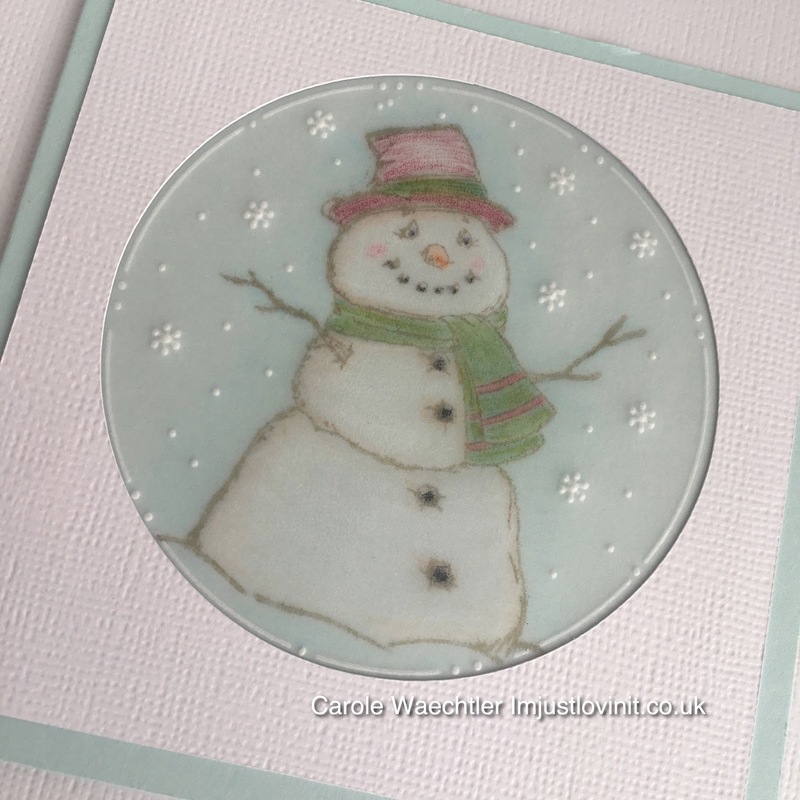 We used Pergamano pencils to colour in the bits that are coloured, blended the colouring with a tiny amount of alcohol and then very gently embossed the body and face of the snowman. I'd still rather not use brads on parchment, so like usual, I made a frame to fit perfectly, on my Silhouette Cameo. 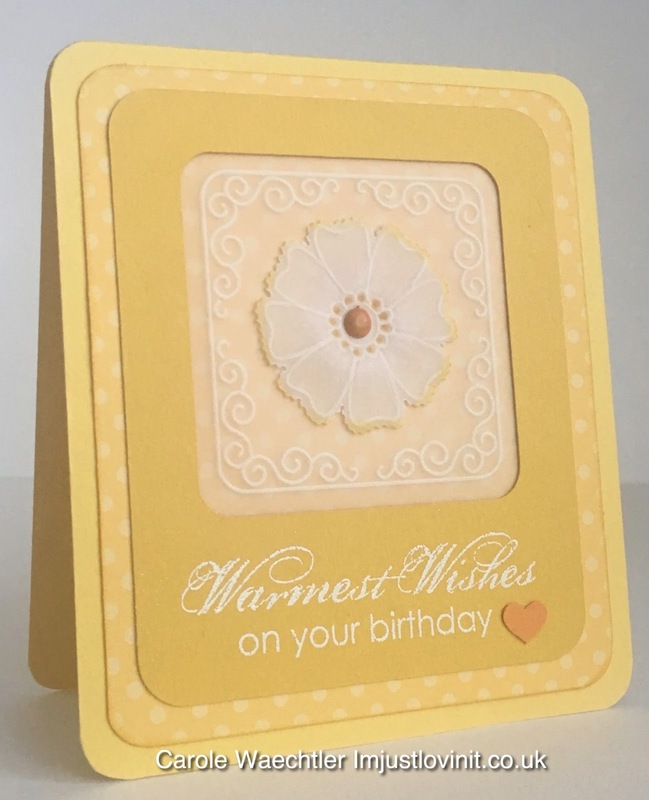 After photographing the card I thought it needed a little something extra so I produced a matching rim, again using my Silhouette machine. I die cut the parchment using a dotted frame die, on the back we dabbed (with a sponge) Brushos mixed with alcohol, it was great fun. 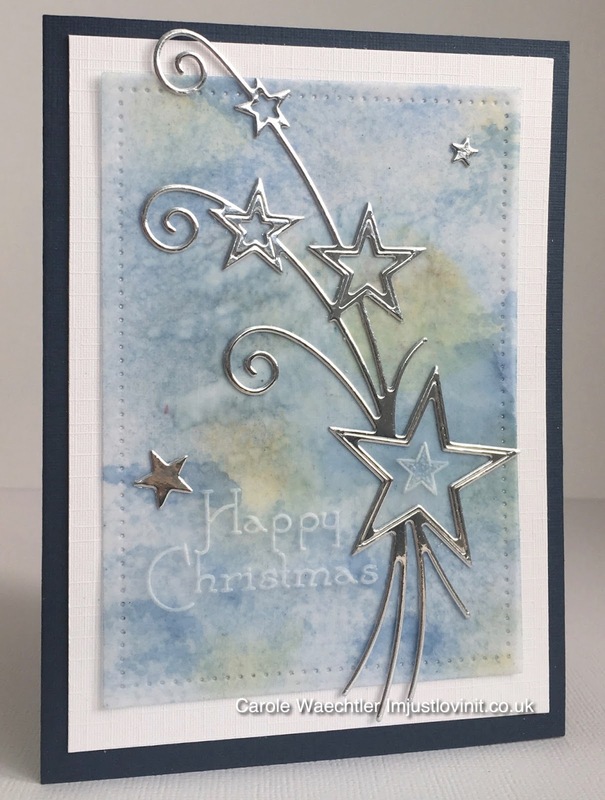 We stuck the star die cut on the the front and hid Perga glue behind the bits on there to attach the parchment to the background mat and card. Again not a brad in sight, just carefully dotted glue ;)! Our final card was actually more about the envelope than the card, to be honest. I found a great envelope made by someone on Pinterest and thought it would be a fabulous parchment project. I made one in parchment but it wasn't great (I wasn't careful enough with the scoring so the parchment tore a little bit in places), I showed my students and we decided to go with making a paper one in class, they then had the option of making a parchment one at home. The card is very simple! There are actually two different ways of folding the envelope for two different effects, you'll work that out if you make one! I hope I've inspired you to change up those nested Groovi plates and try a little something new with your parchment craft. 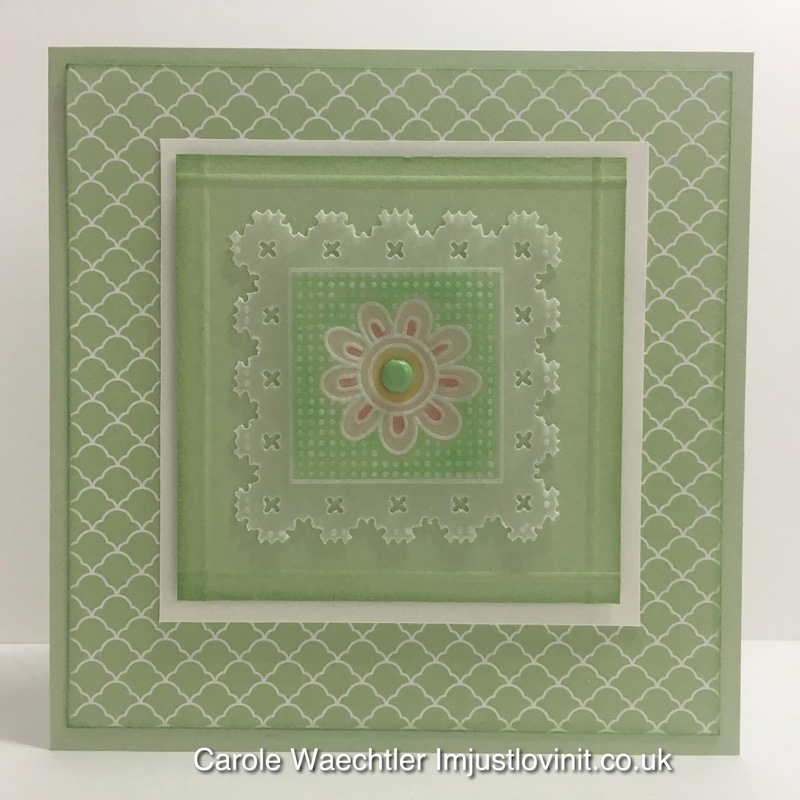 Silhouette Cameo - Lessons - Graphtec UK & NEC Hobbycrafts show 2017! What a fabulous day I had yesterday at the Craft & Hobby show at the NEC. I was given the chance to demonstrate for a short while on the Silhouette UK stall, so that Lisa could have a little break. I really enjoyed being back at the NEC demonstrating, it's been years since I was last there "on a roll" and I loved it! They are a great bunch of people, showing, sharing knowledge and selling great Silhouette products and I'd like to thank them for giving me a little go, at what I used to do best! I chatted to lots of people and it seems that there are lots of ladies out there who do need help with the software. I have been teaching on a one-to-one basis for about 5 years now and am happy to discuss with you about what you'd like help with and how I can help you, to get the best out of your Silhouette Cameo or Portrait machine. 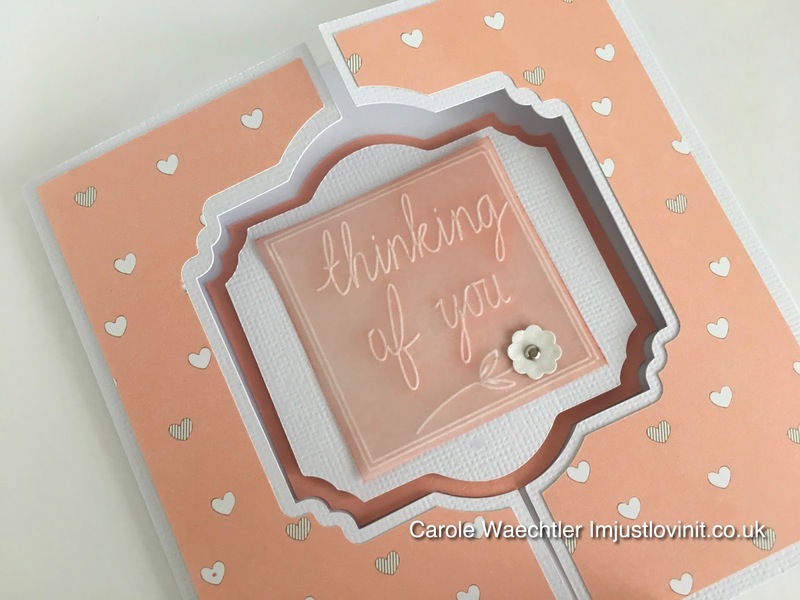 Over the years I've given one-to-one Silhouette software lessons to a jewellery designer, a book binder, a few ladies interested in home decor, three or four teachers who bought the machines for decorating their classrooms, and quite a few card makers and scrapbookers. Most of these ladies have travelled miles and miles, either by car or train (I can pick you up from my local station - 3 minutes away) to my home, where they have been given my full attention on how to help them the best. They also get ongoing support for a few weeks afterwards, just in case they need reminding of anything. 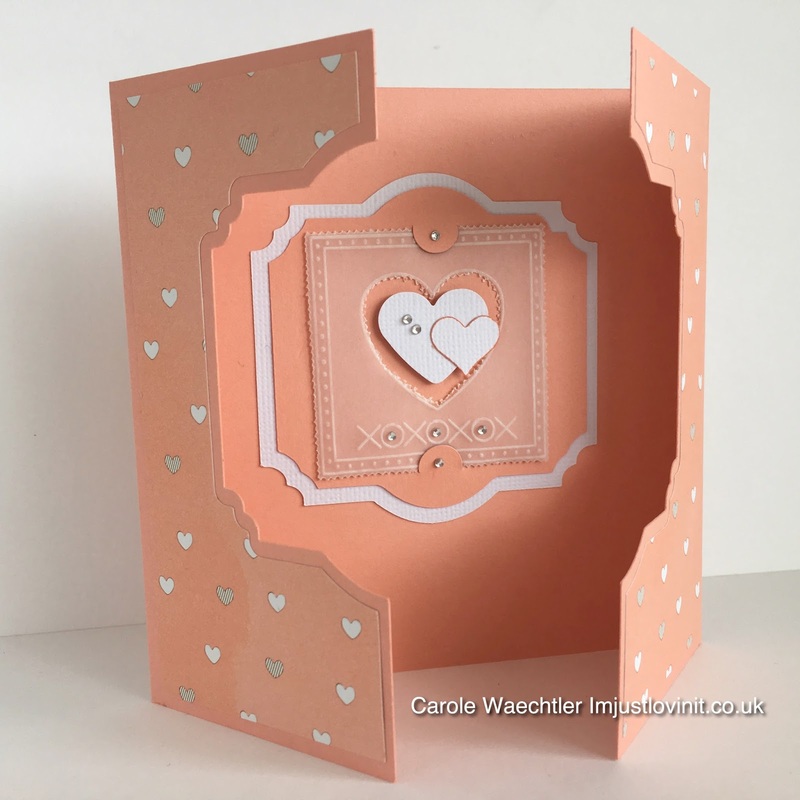 You can learn a lot by designing and making a card, no matter what you use the your Silhouette Cameo for, you do need to learn the basics. You can do that by yourself, there are so many wonderful on-line tutorials out there or you can indulge yourself, take away the search and the stress by spending a day with me! My contact details are on the right side of the screen. Email me if you are interested in learning about how to get the best out of your Silhouette Cameo or Portrait machine, or if you'd like a lesson before you decide to make your purchase! I'm guessing some of you reading this haven't even got yours out of the box....go on - do it - unbox it, download the software and have a play - you certainly won't regret it! I'm so excited, I just can't hide it! Look what's just arrived! I only decided to order one yesterday lunch time and it's arrived today. Thank you Graphtec for your very prompt service, I am so impressed! To begin with, when I got it out of the box, I thought it was much bigger than my Cameo 1, but it's not all that much bigger. It's just more solid and better designed, I'd say. I was going to wait for a while before I upgraded but it seems that the launch of this new machine has bought more interest to my little old blog :). I am having requests again for one-to-one tuition, on the Silhouette software. I taught a wonderful lady last week who had bought her Cameo 2 about two years ago and hadn't even gotten it out of the box! In fact she tried to return it to the supplier she bought it from, hopeful for a swap, to no avail. The lovely lady concerned felt better about her machine, when she saw my old Cameo 1, still working for me and doing what I want it to do, chugging away merrily after about 5/6 years! She doesn't need to upgrade, now she's had a one-to-one with me at my home, she just needs to get it out of the box and get designing and cutting! She will be brilliant at, when she gets going - she's a jewellery designer! So what made me upgrade? Well, I've had another couple of enquiries about tuition, one lady I can't contact because she left me a comment on my blog post and I have no way of contacting her......hope she's reading this and another lady who has booked a whole day with me the week after next. The lady booked in to my diary has a Cameo 3! So there we are.....I need a new one! There a fair bit of difference between the two machines and in order to get myself up to speed, I could have watched a whole load of Youtube videos or I could "just" buy one! 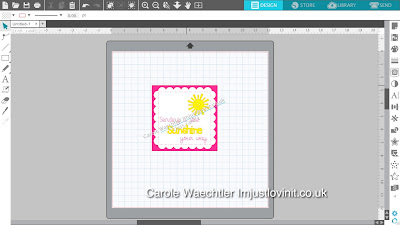 I would consider myself an expert in most of the features of the Silhouette software, that a general card maker or scrapbooker would want. If you spent a day with me, you could get yours out of the box, with the confidence that you can make beautiful projects, using the features that you're most interested in. We would exchange emails where I listen and learn from you what you're actually looking to create, so that I have an idea of how I'm going to get you to get the best out of your machine in a day! For details, email me, my email address is just over there......on the right of your screen! I've got a colourful parchlet twinchie to share with you today made especially for our FB groups creator, Tina Cox. The actual parchment part of this card is just 2 x 2 inches. Tina loves grid work so I included some of that on my little piece. We were asked for "colourful", which is quite out of my comfort zone, to be honest but I'm pleased with how my colourful work turned out. I used one of the Groovi plates Tina designed for the butterfly, it is actually my favourite Groovi plate - I love her designs and style. 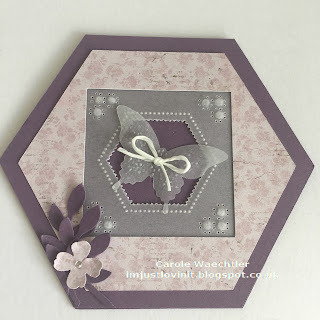 I also used the nested square frames and the piercing grid to make my pattern. 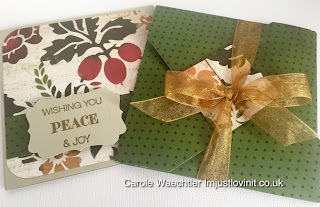 I used my Silhouette Cameo to cut the tag style card and mat with the two and a quarter inch square aperture. I hope you find some time to craft today. I have another little twinchie to share with you today. 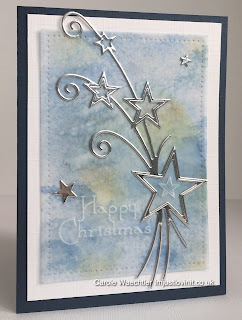 This week our FB group is using silver in our creations. With the terrible news that hit London again yesterday, I kept my creation simple, thinking of all involved with that tragic incident. 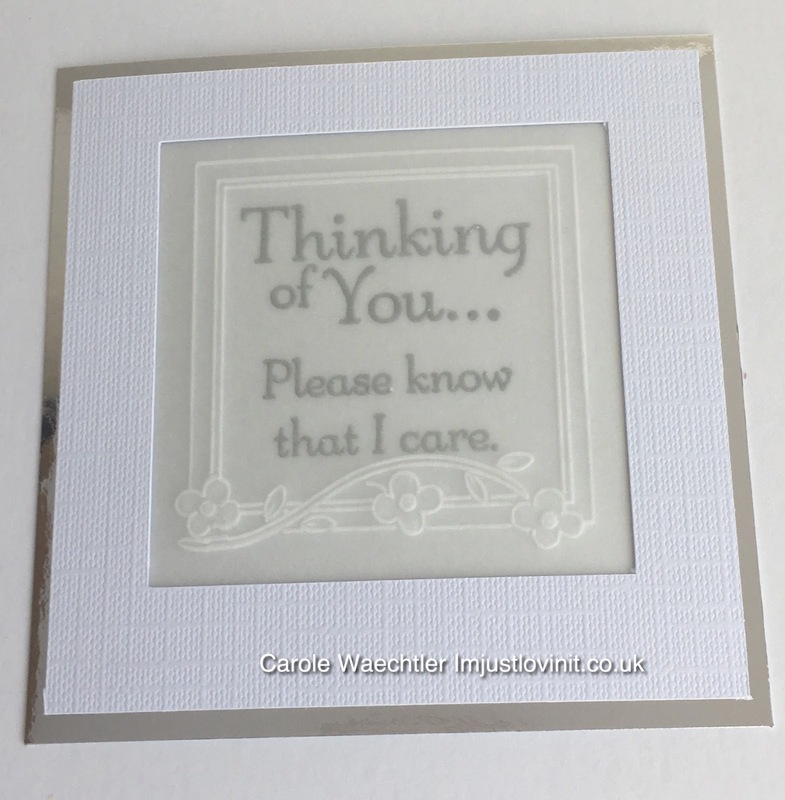 I've silver embossed the sentiment, used the new Groovi Spacer plate, the Nested Square plate and the Scalloped Nested Square plate. I cut the aperture with my Silhouette Cameo and matted the parchment on silver mirror card. Thanks for popping by again today. 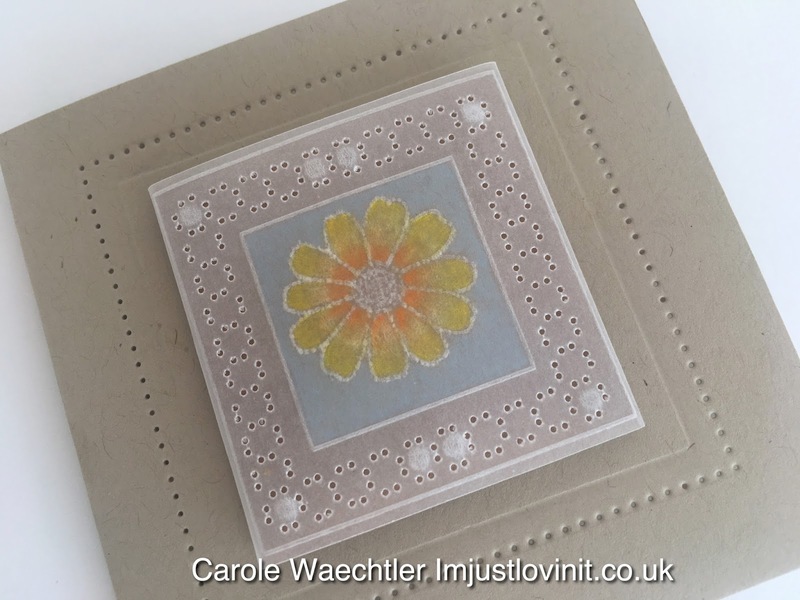 I've got two 5 inch square, gate fold cards to share with you today. Over on the Parchlet Treasures FB page they are asking if we could use orange for some of our artwork this week, to hight light lots of different charities. Checking through my stash, I came across this rather beautiful paper, it's sort of a pinky orange colour so I thought I'd use it. Anyone who knows me, will know that I will always spend a little more time on the actual card design, composition and how I'm going to mount the parchment, than the actual parchment piece! It's just the way I'm programmed, I suppose. This is why I'm really liking these parchment twinchies, I can make a small simple piece and go from there. I designed and cut the decorative mats on my Silhouette Cameo, it's easier than you think! I welded together an oval, a square and a couple of rectangles, it's as easy as that! From there I was able to make the gate fold square card, with the exact same shape cut away - simple! As you can see from the second card, I even designed and cut a couple of slots to hold my parchment piece into the top mat :)! 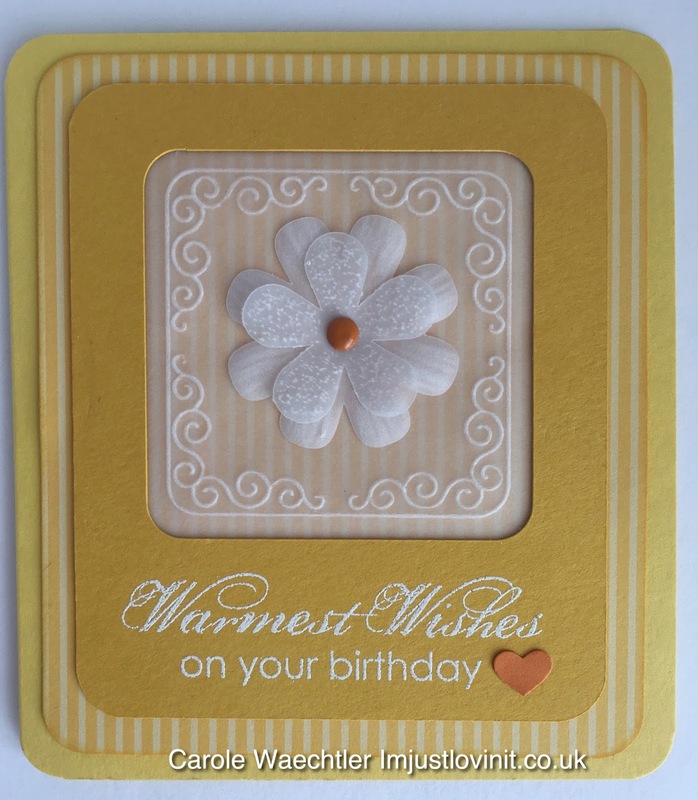 The parchment twinchie on the first card is only held by that one tiny brad in the centre of the flower at the bottom. I think people think that they need to put a brad in each corner but it's not necessary for such a tiny piece, I don't think, as the parchment itself is fairly strong and rigid, it easily holds up on its own, even if the brad is in the bottom corner ;)! Just so you know, the cut out heart in the centre of the second parchment twinchie is a design change! I had a big accident with my Perga glue so ended up pricking the heart and instead of snipping it out, with a chance of ruining my Perga cutters, I gently tore it out ;)! So pleased that the Parchment Police can't get me for that these days ;)! Thanks again for popping by and thanks for looking. I've got another little Parchlet Treasure to share with you all today. I used various Clarity Groovi Plates to create this piece and I've used Perga glue to mount the parchment onto the card stock. I hope you have some time craft today. I've got another Parchment Twinchie for you today. I started this "Parchlet" not actually having a card in mind, then I remembered that I did need to make a 30th birthday card so ended up inserting a "30" in the gap I'd created for a sentiment. I embossed the whole twinchie line art with the no. 2 tool, which makes the lines softer, which in turn makes the white work easier too ;)! The sections I fully embossed, I used the no. 4 tool Groovi tool first then went over the work again with the no. 3 tool. I used the Square Groovi plate and the Christmas tree plate - I really like the design on the Christmas tree, not just for Christmas - eh?! The dimension on the white work is quite impressive when you look and feel it up close, which I'm very pleased about. If I'd have wanted to spend a little more time I could have allowed my work to rest and gone over the white work once more, to make it 'whiter' but I'm happy with how this turned out by just gently embossing the areas twice in long, smooth and gentle strokes. The Parchlet is attached to a piece of card stock the same size by one tiny staple - underneath that little punched patterned heart, you can almost see the staple on this close up picture (so I did actually stick a second punched heart on top, to hide the staple mark!). I'm so pleased that I'm able to get back to Parchment craft, Clarity has really got me hooked again and for that, I do thank them. What an incredible day I had out at the Bristol Parchment Exhibition yesterday. There were lots of very enthusiastic and talented Parchers there sharing their work, tips and tricks with us. I took a little gift along with me to give to Tina Cox, she has totally inspired me to keep up my Parchment work by setting up the Parchment Twinchies group on FB. .... she's such a blessing in the Parchment world! 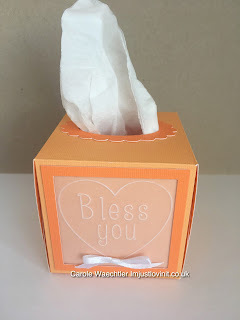 It's a tiny tissue box, the "bless you" in the heart, on the front is just 2 x 2"! I got the file from the Silhouette store and cut it out on my Silhouette Cameo. I learned a couple of new tricks whilst I was there yesterday. One was to stipple the outline of an image on a Groovi plate and the other was how to colour with wax pencils and then watercolour pencils on top. ...I was fairly happy with my stippled outline but not so happy with my colouring, I definitely need more practice on that! Although, I was very happy with the blue background. I used some old waxy pencils that I'd had years and years ago Karismacolor by Berol and blended the colours with Sansodor (my bottle is as old as my pencils)! I hadn't thought to use Sansodor on Parchment, but it does work well, I used a blending nib by Ranger and worked round and round in circles. The problem occurred when I tried to use water colour pencils on top, it went a bit grainy so I might just have to email the lady who taught me yesterday to see where I went wrong. As for mounting my Twinchie, you can see from the last photo that I wrapped the Parchment Paper around the back of a two inch square of card stock and adhered it to the back. The flower came from the Wedding Cake box. It's a good size for such a little work of art. I used Tina's Straight Piercing Border plate for the pricking. 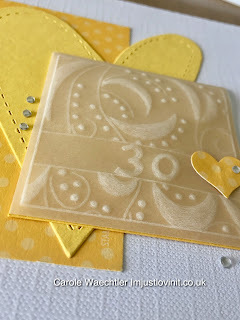 I used a die from my stash to add the tiny holes to the front of my card. My desk is in a total mess, I'm off to tidy it up before I dare work play any more ;)! Thanks for stopping by, I hope you find some time to craft today. I'm definitely on a roll, feeling totally inspired by these miniature works of Parchment craft. Today I have another green one, I do love the colour green and I really like this shade! 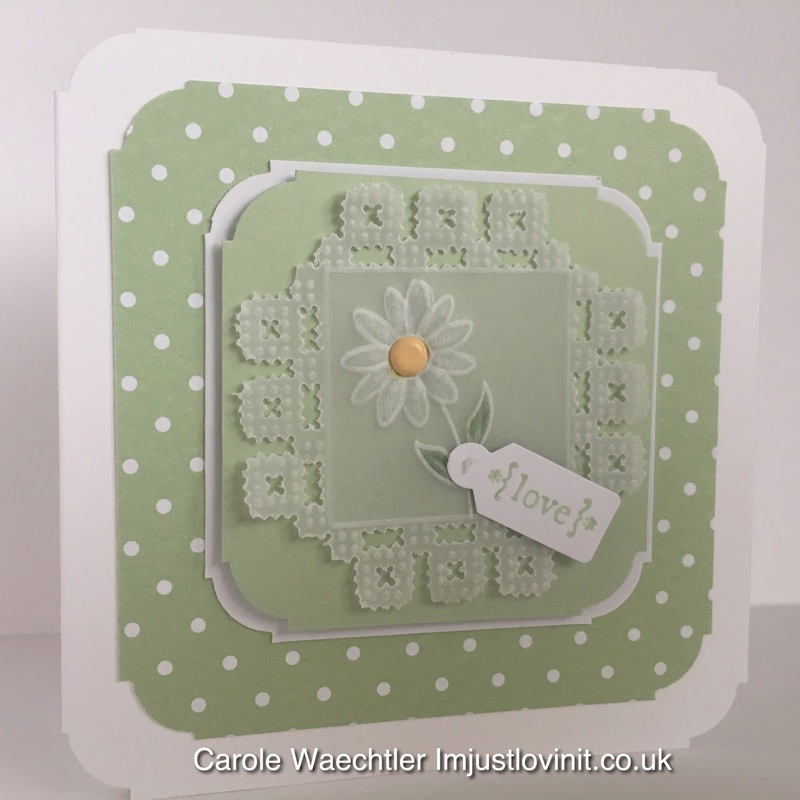 Whilst looking through my Groovi plates to see what I can use for todays card, I found one of my absolute favourite ones, the Wren & Daisies baby plate. 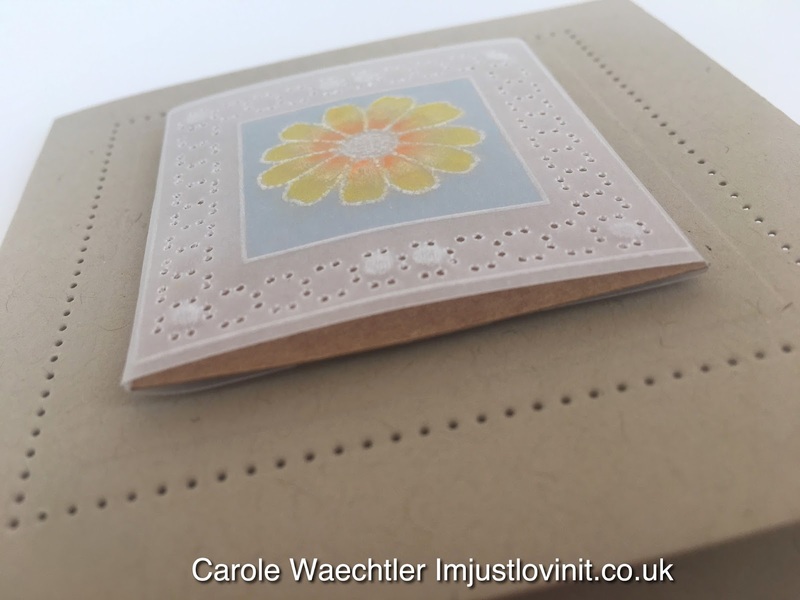 One simple daisy in the middle of all that parchment lace would look great, I thought. 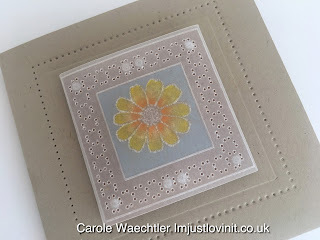 I used the Groovi Straight Border grid again and found the inspiration for the border on this piece on Tina Cox's blog. She really is inspirational, I love her work. I hope you find some time to get into the Groove with Groovi today ;)! 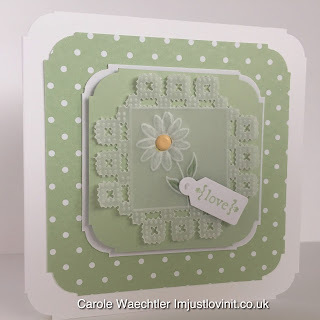 Yesterday on Tina Cox's Parchlet Treasures FB group we had a theme for our miniature works of art, it was 'green' to try and help raise awareness of Mental Health issues. I used three Groovi plates to make this, Funky Henna, Straight border grid and Straight Basic Piercing Grid. I didn't make any fancy frame for my card on my Silhouette Cameo this time. The Parchlet piece is held by the brad in the centre of the flower! All card stock and paper are from my stash. I've got another similar one to share with you tomorrow. It's one of my friends birthday today and I wanted to make her a little Parchy card! 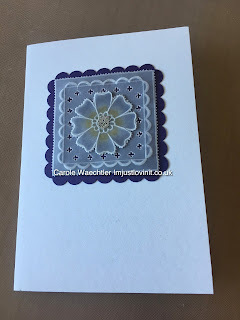 I don't normally send out my parchment cards, I save them as samples and keep them secret, as I'm still filling in for the Parchment tutor at Denman (although I really ought to by saying "winging it" for the Parchment tutor!). I do love tutoring there and the ladies that I'm teaching seem very happy - thanks to Clarity and the Groovi system, for sure! Since the very lovely and talented Tina Cox started a FB group called Parchlet Treasures, I seem to have taken the whole idea on board and realised that I can add just a small amount of parchment work to my cards and actually send them out to my friends and family! 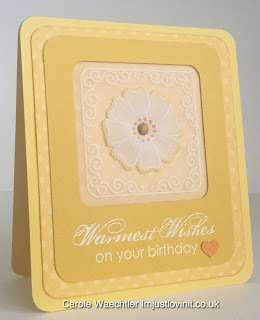 ....it is very similar to the card I posted yesterday, but today I cut the flowers out on my Silhouette Cameo. 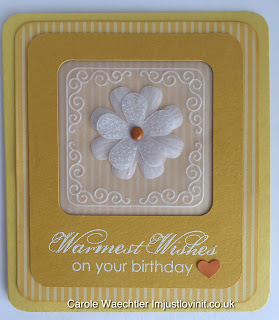 I gently embossed the base flower using the flicking kind of embossing and stippled the top flower. I thought stippling would be quicker than picot cutting, but I think I got that wrong! Anyway, I'm really pleased how this card turned out and I hope you (and Alex) like it. The parchment frame comes from the Groovi Border Plate Mate. The flowers are from the Silhouette online store and the rest is from my stash! I hope to be back soon with some more Parchlet Treasures. I'm back to share another little Parchment Twinchie with you today. The actual parchment work on this card is just two inches by two inches. I made the aperture in the frame just a little bigger than the parchment work to give it a border, on my Silhouette Cameo. If you zoom in you may notice that I've been practicing my picot cutting on the flower. 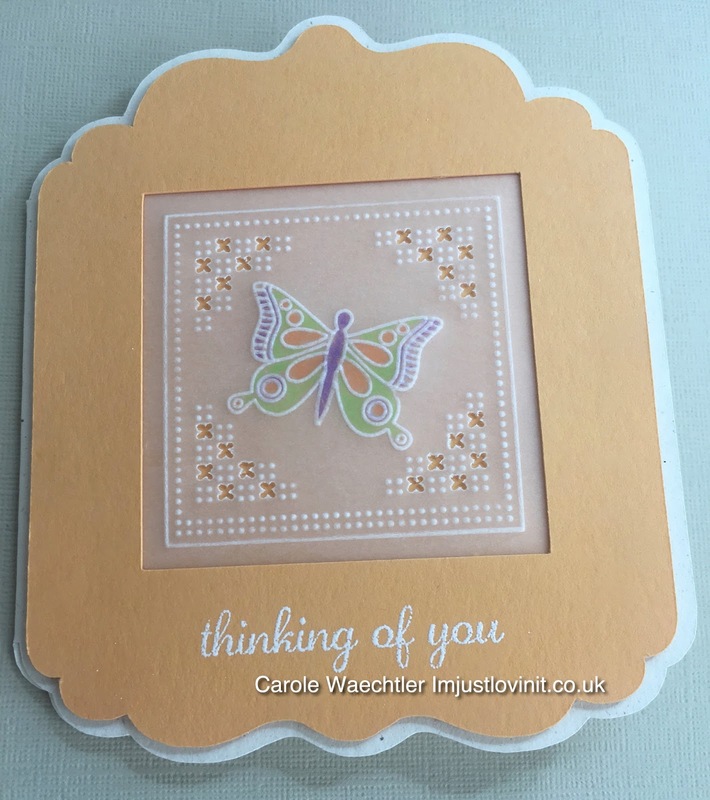 I've used two border plates for this little card, one that comes with the Border Plate Mate and the other one is the Funky Henna one. The card stock, paper and sentiment are all from my usual stash! Gosh, it's been almost a year since I posted something on here! I'm going to refrain from the asking the question "have you missed me? ", as the last time I asked that question to a group of ladies, I didn't like the answer one of them gave ;) ha ha! My life has gone in a different direction, a direction totally opposite to crafting (TFW - Training for Warriors, Abingdon), that's for sure! Although I have been crafting a little, because I've needed to - for my tutoring work at W.I. Denman and each time I finish a course there, I always did mean to blog and share what the ladies had made but somehow time never allowed - I apologise. Anyway, why are you hearing from me today? Well, I've been totally focused on only a couple of things for the last few months and I need to make some changes, to cut out some stress in my life and to get myself better. Basically I want to do something for somebody but I can't, because what I was doing was making me really pretty sick.....I've been trying to help someone, which was fine during the winter but over the last few weeks my skin has gotten worse and worse and I was becoming more and more emotional and tired. My husband worked it all out on Friday - the neighbourhood I'd been spending only an hour or two at, 3/4 times a week, where I was doing something lovely for someone who is really suffering right now, has a couple of Silver Birch trees - I'm 100% allergic to birch, not just the pollen but those trees release chemicals off their leaves that keep aphids away and it is that chemical that burns my skin and brings me out in huge horrible and very uncomfortable blotches!!! So here I am, back to being perhaps almost house bound until the end of November, when those pesky trees stop bothering me! I'm back to driving everywhere as I can't risk walking past one! I was feeling really sorry for myself yesterday, wondering what on earth I was going to do now, when I had two 'signs' to get me crafting for pleasure again. 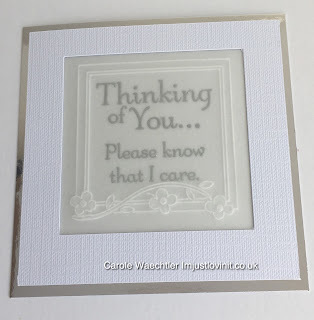 One was seeing on FB that the very talented and gorgeous Tina Cox was setting up a Parchment Twinchies page, which totally inspired me to try and make something to share on her page and the other was, that I've been contacted again by a lady asking if I still teach Cameo Silhouette lessons. For me I've always felt that Parchment craft goes really well with my Silhouette Cameo. 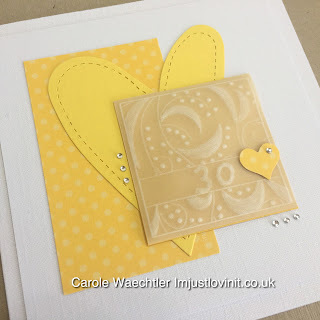 After all trying to attach Vellum to cards has always been as pesky as birch trees are to me ;) and I can make all sorts of frames to hide glue on my Cameo ;)! I'm hoping this is the start for me to getting back into some crafting for pleasure again, although I've been hampered greatly by greasy fingers - I need to plaster on the ointments to make my skin feel even slightly comfortable at the moment and even if I wash my hands thoroughly afterwards, I still find myself with greasy finger tips after a little itch here and there, on my face, neck and arms from those blasted tree blotches! 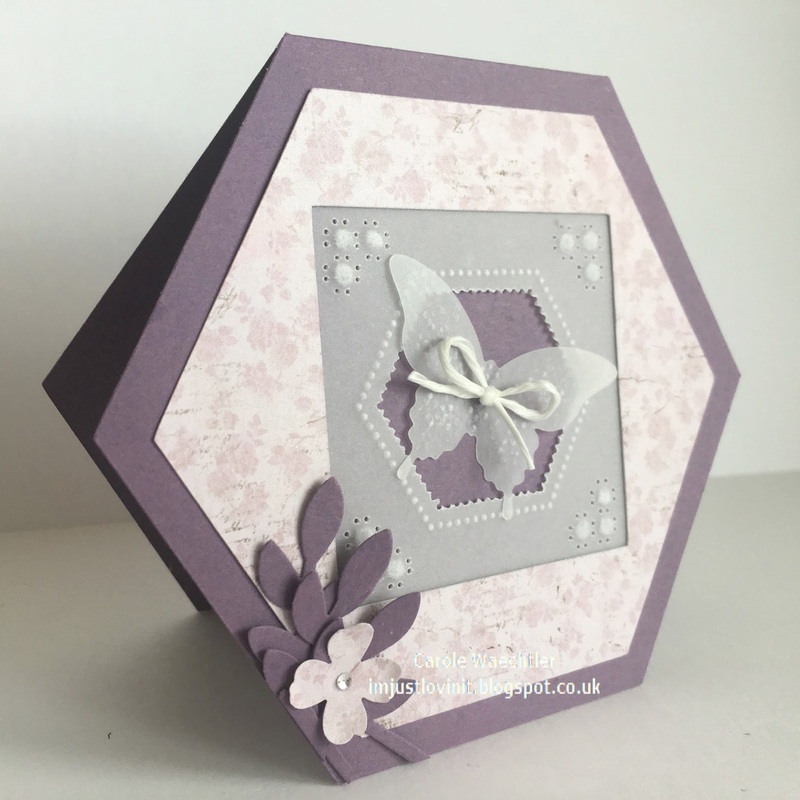 This little card has taken me ages because of the my greasy issue, but I hope you like it! I made my own Silhouette Cameo file to create the card base and patterned paper mat, which has a two inch square aperture, which easily hides all the adhesive underneath :)! Hope to blog again soon.